Powder snow paradise ‘Mt Norikura ‘ will be opened 9th Dec.
Mt Norikura Snow resort will be opened on 10th Dec. 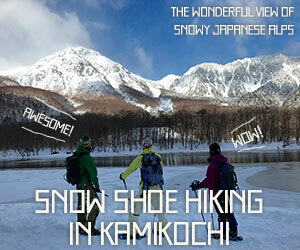 The feature of Mt Norikura is to be able to enjoy the highest powder snow in Honshu. There are 21 courses in ski area. Some courses are not compacted snow and there are some side country area so, you can enjoy the powder ride!! There are also wide flat slope for beginner and family. The guests who stay guesthouse Raicho can buy the lift tickets(1day) as below. ※You can buy the lift tickets with 2000yen until 17th Dec as pre-open period. ※Free shuttle service is available in the every morning. Mt Norikura is fantastic place to enjoy the Backcountry ski and snowboarding. You can drop at top of Mt Norikura 3026m!! We look forward to seeing and playing with you in winter season.